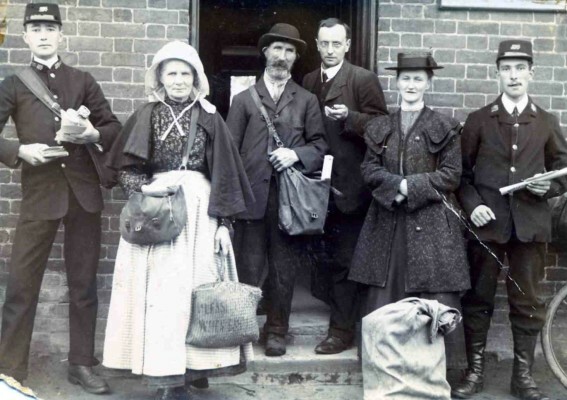 Bottesford Post Office Staff, 1912. This photograph shows the staff of Bottesford Post Office taken in 1912. It is from Bill and Barbara Sutton’s collection of family photographs and is embossed ‘F.Taylor’. Frederic Taylor is listed in Kelly’s Directory of 1916 as a “shoe maker and cycle dealer. A number of photographs of that period are similarly embossed. We do not currently have any further information as to whether Frederic Taylor had commercial interests in photography or whether it was a hobby. I just came across this page searching for anything about my relatives and was very interested to see the names Skillington and Rawdin come up. I wonder who Mrs. Skillington is as my 3xgreat grandad Thomas Branston’s sister Mary Maria married a Charles Skillington in 1821 and I have found that they had about twelve children, most of whom lived to have children and grandchildren. I think James S Rawdin may also be a relation – I have a James Samuel Rawdin b. 11 Feb 1887 to Thomas Rawdin/Rawdon and Catherine Bockin who is descended from an Elizabeth Branston b. 1769 in Bottesford (aunt to the Thomas Branston I mentioned above). I don’t know if this is any help but the picture is very interesting. Thank you very much for this further information. Great to receive this type of feedback. We have not checked all the census records for Mrs Skillington. If you have any Bottesford or local addresses for her please do let us know. Many thanks. I’m also very interested! Nearly all the Dents are mine in the village back to 1786…. one of the Dents married a Skillington and we have a Joseph Dent married a Anne Rawdon who died shortly after giving birth to her 2nd child. The Rawdons who married my Dent were from NOttinghamshire, though. I have just had another look at what I have about the Skillingtons in my tree. The youngest child of Charles Skillington and Mary Maria Branston was William (1845-1904) and his wife was a Fanny Dixon from Carlton-le-Moorland. The interesting thing is that William was described as a rural postman or a rural post messenger in the census records between 1861 and 1901, so perhaps “Mrs. Skillington” is actually Fanny? She didn’t die until 1916, when she was 71. It is a bit hard to tell how old the lady in the picture is but I suppose she could be in her 60s. William’s brother George (1826) and his wife Elizabeth were both dead by 1912 and lived in Whatton. Just a comment about the funny-looking postie in the centre of the pic. Joseph Parnham is the older brother of the “famous” cricketer John Thomas Parnham who moved to my neck-of-the-woods (Lancs) around 1880 and is a distant relative of mine. Joseph Marshall Parnham was actually born in 1849 (some census entries are way out with birth years) Then again, JMP looks like he may well have forgotten when he was born!!!! Luckily for me any family resemblance has been lost down the years! PS. Where’s his uniform?!! I would be interested in any further info you have on the ‘Rawdin’ family – I think Samuel Rawdin (b.1851) of Queens Street is my great-great Grandfather. Clare, Thanks for the enquiry about the Rawdins in Bottesford. There is a lot to say, but perhaps the best advice is to type ‘Rawdin‘ into the search box at the top of our home page and then follow up the many leads that it give you. You will also find records of the Rawdin family from the 1841, 1881 and 1901 censuses that are on this website at Topics – Census Information. Samuel Rawdin was a member of the village band. He is seen on our page Topics – Events and Celebrations - “Normanton Celebrates the Coronation of King George and Queen Mary”in the picture ‘Detail Right’, in which he is standing at the front, third from the left, holding his instrument. Very interesting, I’m researching my g g grandfather Thomas Rawdin for my sons homework they were from Bottesford and he served in the Boer War. My son is also called Thomas like my father, grandfather etc etc. I noticed a Claire Rawdin had commented – wonder if we are related. Hello – just saw your comment! Yes – I wonder if we’re related. I’ve never met a ‘Rawdin’ from outside my immediate family. My grandfather was Samuel Arthur Rawdin (born 1912) and came from Nottingham but not sure if he’s related to the Bottesford Rawdins. My own father never knew his paternal grandparents. My grandfather, Charles Calcraft, is on the left of the photo. I think he was living at Spalton’s Row, not the Nook, at the time. My mother is Ann Calcraft (Clowes), now deceased. Hello Pam, Thanks for pointing this out. Although Charles was at The Nook in 1901, in the 1911 census he is recorded at 2, Wyggeston Terrace, which of course is the later name that was used for Spalton’s Row. He lived there with his parents, George and Elizabeth. Neil.